I was excited to get my hands on the hot-pink chalkboard that she had hanging on her wall. It was just begging for some TLC. It somehow gained some gross (hard-to-cover) ink stains over the years, but they didn't stop me. I had been wanting to use some chalkboard paint for awhile. I just so happened to have gray chalkboard paint on-hand from another project that I never got around to making. It was so EASY to use the paint and so fun to up-cycle this nasty-looking pink board. 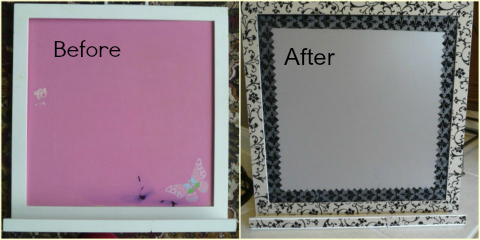 I used Mod Podge and decorative paper to cover up the ink stains that weren't hidden by the chalkboard paint. The decorative paper also gives the chalkboard a more mature look. The photos below show how easy this project was to create. 1) Start off with the nasty-looking board. It didn't require any prep other than dusting. 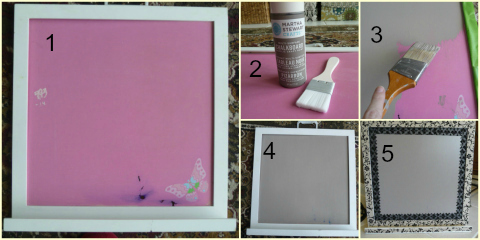 2) Use chalkboard paint and a brush large enough to make wide strokes. Make sure the brush doesn't leave behind any bristles. 3) Apply a few coats of paint, waiting about an hour between coats. 4) Allow all of the coats to completely dry. 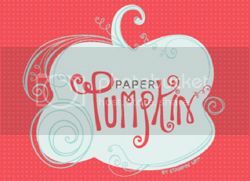 5) Cut and glue strips of decorative paper using Mod Podge. Yes, it really was THAT easy. More room projects coming up, including up-cycling a bulletin board and making a hanging decoration for the ceiling fan chain. Stay tuned.